the video tutorial so nobody will be stuck if they don't have safety eyes! Oh, and the head and body are now one piece which means less sewing ~> yahoo! Read me ~> Work in continuous rounds, do not join. I used Red Heart Super Saver and also Red Heart Comfort yarn with a 4.50 mm hook. If you crochet more on the loose side then use a smaller hook so you don't get gaps and stuffing showing through the stitches. Have any questions or if you come across a mistake in the pattern please leave a message in the comment section below. Read me ~> How to read the rows: Each row has a sequence as given below. Example: 1sc then 2sc in next st means repeat that sequence 1sc then 2sc in next st followed by 1sc then 2sc in next st over and over to the end of that particular row. The number inside the parentheses ( ~ ) is the number of stitches you should have at the end of that particular row. Read me ~> It's a good idea to add in a marker at the end of row 2 and move that marker at the end of every row. I just use a short length of yarn and pull it through the last stitch I put in at the end of every row. 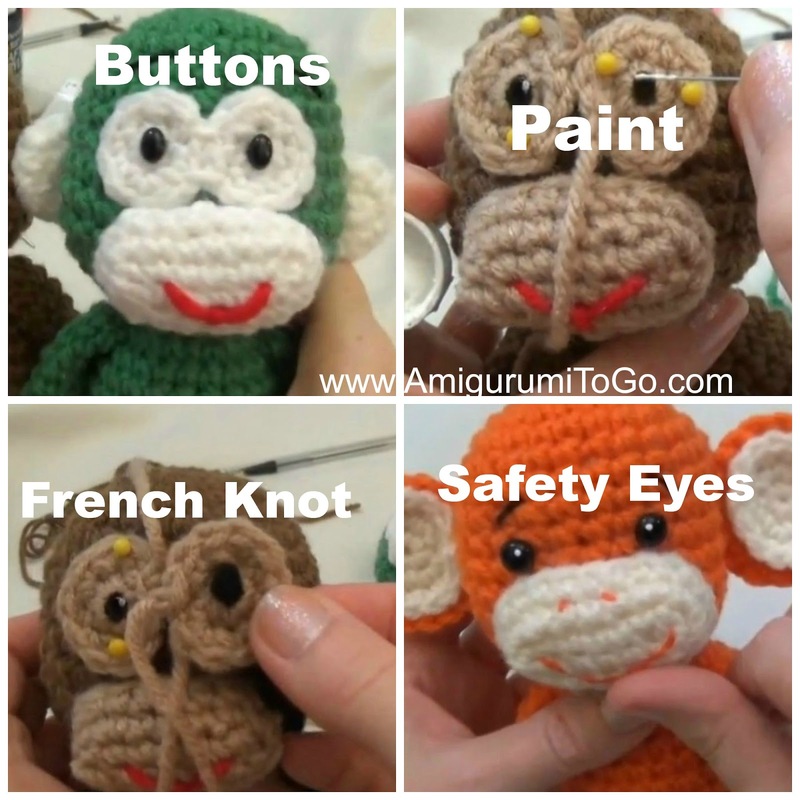 *If making the monkey w/o patches, the eyes are put in between the 9th and 10th row with 3 visible stitches between them. 5) (we only use 4st of this row) 1sc in next 3st, sl st next st and f/o leaving a long tail for sewing. Add in a mouth before sewing muzzle to head. f/o leaving a long tail for sewing. Sew 2 together (wrong sides together). Do not stuff. Sew 2 wrong sides together and whip stitch the back loops together. Knot off each corner. sl st and f/o leaving a long tail for sewing. Lightly stuff hand, do not stuff arm. sl st and f/o leaving a long tail for sewing. Stuff & shape foot (tips on stuffing at 39:43) stuff leg. 6-18) 1sc in each st for 13 rows *stuff the lighter color part of the tail, do not stuff the rest. If you assemble the doll in the order I give you then you will not have to worry so much about centering the different parts as much. 4) sew on the muzzle (top of muzzle should sit just above the 10th or 11th row). 6) sew on the ears (between the 8th and 12th row). Pin them in place before sewing them in helps. But again, view the video for tips on sewing this part. Hope you enjoyed this pattern, come back soon! You may sell finished products. Do not reprint this pattern on any site, magazine or book. If you'd like to share this pattern please provide a link back to it. I didn't think you could improve on the former pattern, but you did. Those ears are so precious. Thank you! how tall does this monkey crochet up to? Thank you so much for taking the time to write and I'm so very glad you are enjoying the pattern. I wish you all the best and best wishes to your niece as well. I love all of your work, how would I make some of the animals as big as the bunny? How big is the completed monkey? À very big '' MERCI'' You mmade a very big work to write that !! I was searching for à tuto to make this litt le monkey. I fond your vidéo on YouTube... And thé tuto here. Thank you very much..
All of your little critters make me smile! I appreciate so much your generosity. I have 2 big foot bunnies in progress and cannot wait to begin this monkey. I think it looks great without them, the orange monkey doesn't have patches and I show how to do french knot eyes in the video. I live your patterns for these toys. I am a beginner and find your patterns easy to follow. My grandsons love dinosaurs, so I'm wondering if you have a pattern for one? Thank you fir sharing your projects. What a great pattern. When my grown niece saw it, she immediately asked for me to make one for her. It's a quick working pattern and so cute. Thanks for sharing. Now I guess I'll have to take a look at your other patterns. I'll be crocheting all summer long! Nice. Thanks for giving alternatives to safety eyes, which I never seem to have on-hand! Thank you for your pattern and fantastic video!! I saw this adorable monkey on a game friend's FB page and asked her where I could find the pattern. She gave me the link to your site. I am so excited to get started. I will be making at least 4 for my littlest grandchildren. This may turn out to be my new "new baby" gift. Thanks again!! Wow, he turned out so great!! Your tutorials written and video are so easy to follow. I am new to crocheting. I am also legally blind so some people are hard to follow. I just mastered c2c. Now I am trying your bear and monkey. Then I want to try a c2c graphgan. Thanks for being so detailed. Can you tell us how big/tall the finished product is....eg the monkey.....want to do 2 for my grandkids in uk ...thanks they are adorable!! I made this monkey for a friend who has cancer. I gave it to him on June 21, 2014. He laughed, as that little monkey just tickled him. I put a pipe cleaner in the tail, made the tail a little longer so it could hang by the tail. I showed him how to hang the monkey and there again it tickled him so and said it was so cute and thanked me. My friends wife said, " you like that monkey he made you laugh." July 13, 2014 my friend passed away. But he sure did love your monkey and it made him smile. I'm glad I did your tutorial. My monkey turned out looking just like a monkey. Thank you so much for sharing your wonder and easy to follow tutorials. It made my friend smile and it made me happy. Oh my.. I love this story so much. What an honor and privilege for me to be even a small part of a what made your friend smile. Your story will stay with me, thank you so much for sharing it. I love your patterns...wish there was a way to show you the piggy I made. everyone likes the piggy and wants her. I say no she is my favorite. Your patterns are truly a blessing Sharon Ojala...never stop making them. They are a joy to many more then you know. If you are on facebook you can post a photo on my facebook page, Amigurumi Freely. You can go directly there right from this blog. Scroll up and look to your right for a series of blue tabs. They are all names and the top tab is Facebook. Being a cancer survivor/fighter myself I know how the kid felt. I know I am tickled pink when I get anything from someone. I enjoy the pattern for this and I plan on making some for my grandchildren. I thank you for this! Thank you Sharon, I just printed out the pattern and started it, cant wait to see the monkey all made up! :D Aurora. I am in progress of making my kids each a monkey. 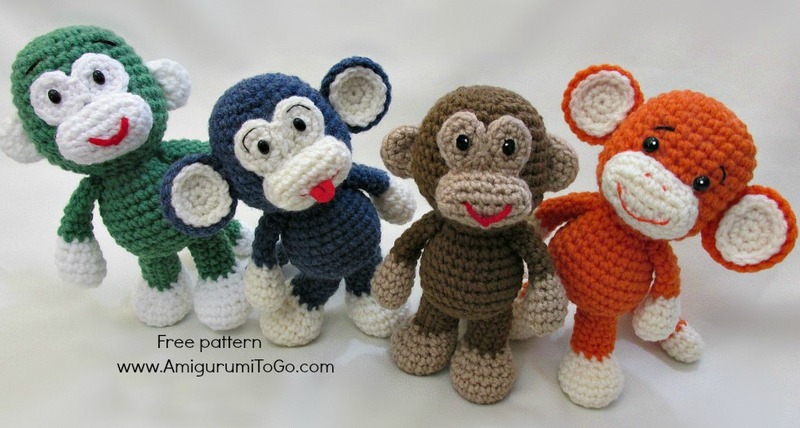 I would love to have a pattern for these monkeys that are much larger. I was thinking around 2ft long. I am not good at altering a pattern to make them the size i want so that is why I am asking for your help. I would also like to pin your pattern on pintrest if you don't mind. I do not have facebook but when I am finished with the current monkeys that I am working on I would love to send you a picture of them and you are more than welcome to post them on your facebook page. Is there a better way that we can communicate? Please send me an email or something so we can communicate better. I came across this on YouTube and found it extremely cute! 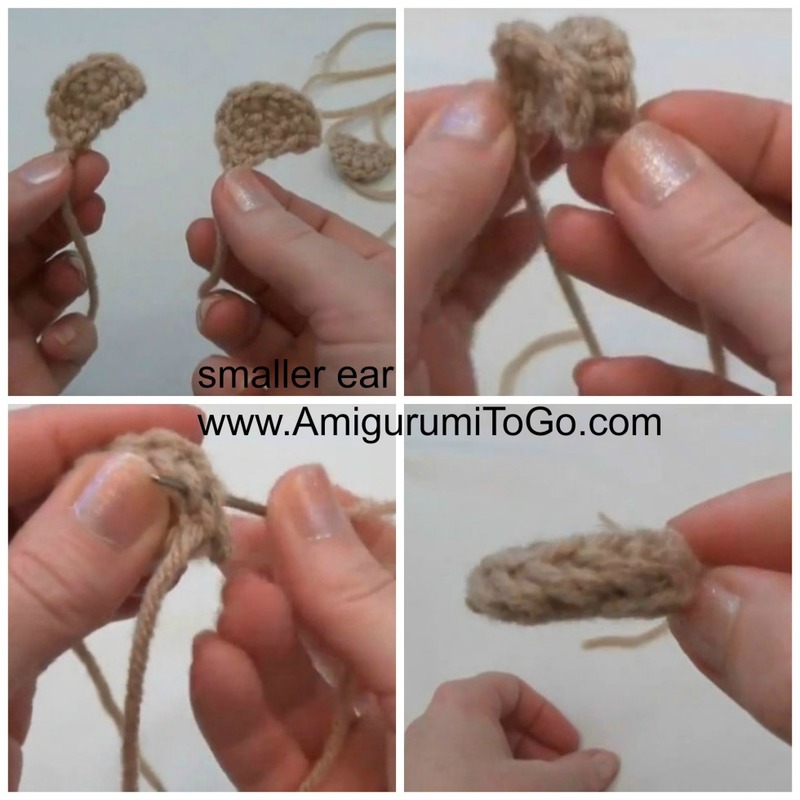 I can't wait to do try this as I'm no good with crochet at all and having your tutorial will be a great help! I even attempted to get some of the supplies today at Michael's but they were missing some of the things I needed. What would happen if I used a 5mm hook? Hi, i have a crazy question. In the beginning of the pattern you said to make 6st in the magic circle, what kind of stitches go in the magic circle? Still new to reading patterns correctly. Wow!! So fast. You are a joy!! Cannot TY enough for sharing your talent, you make it look so easy. Just getting back to my little guy after long interruption. Yeaaa finally finished my first Amigurumi monkey...he is adorable even tho has several mistakes. Now not sure what will try... But wanted to once again TY S... My hubby just been diagnosed with Stage 4 C, so this is a wonderful distraction. Hoping my next one comes out better, might just do monkey again this time avoid the mistakes. Hi, I write from Madrid. I love the monkey it's the most cute I have found online but it's a little difficult for me in English... It would be possible to have the explanation in Spanish? Thanks for sharing your amigurumi. Thanks for being so generous in sharing your patterns with clear instructions and video tutorial. All very helpful. I've just finished a pink monkey for a friend who's expecting a little baby girl. The monkey looks so cute and full of personality. Looking at her makes me feel happy! I´ve started crochet because I saw your beautiful patterns (I´ve never crochet before) and your video tutorials are so understadable!!!! I love this pattern. I was wondering if you plan on making an amigurumi horse? I fell in love with you little fellas that I made one on my day off...and he came out very cute..thank you for sharing!!!! Sharon, I have now completed the monkey, elephant, giraffe, bunny, sock monkey, pig, bear, panda and lion. I can't decide which is my favorite but I can't stop crocheting! Your instructions are easy to follow and I want to thank you for sharing. You have a real talent! :D I fell in love with the orange monkey, and decided to make an orange and cream one (12mm safety eyes, no eye patches, and small ears) for a friend of mine who is expecting her first child. Inspiration struck, and I sewed a black top hat to his head. He is so adorable! Can't wait to give him to my friend. Thanks for the pattern. Thank you so much for the wonderful pattern I absolutely love it! Hi Sharon! Thank you so much for all these adorable amigurumi patterns! it's a piece of felt. I ran a bead of fabric glue along the edge. It held up fine but I'm sure it could be ripped off if a child played with it. It was just a last minute thought so I never made it part of the pattern. I've seen other people crochet a tongue and sew it into place. It looks as if the owner of this site is using your pattern as their own. I just wanted to let you know. Keep creating! Hi Beth, first of all, thank you so much for the kind words, I really appreciate that. I'm so glad you are enjoying the patterns and they will come in handy for Christmas. And I checked out that site. They lay no claims to the pattern although it does appear to belong to them the way they have my description displayed. They do make revenue from ads but they also have it linked back to this site, so that one I will let stay there. It's unfortunate that there's so many people that do things this way but I pick my battles carefully now (it's a time issue) and this one gets a pass. But I really do appreciate you letting me know! All the best to you and happy crocheting! I wish I could post pic of my cute little monkey...Giraffe is next!! Thank you Sharon for the wonderdul pattern.. Your instructions were very clear for the begineers to try.. Have tried your pattern and it turned out well.. https://m.facebook.com/profile.php?id=1593525634239087&_rdr..
Do you have a pattern for the banana? How many yarn did you need from each color for 1 monkey ? I want to do two of them. 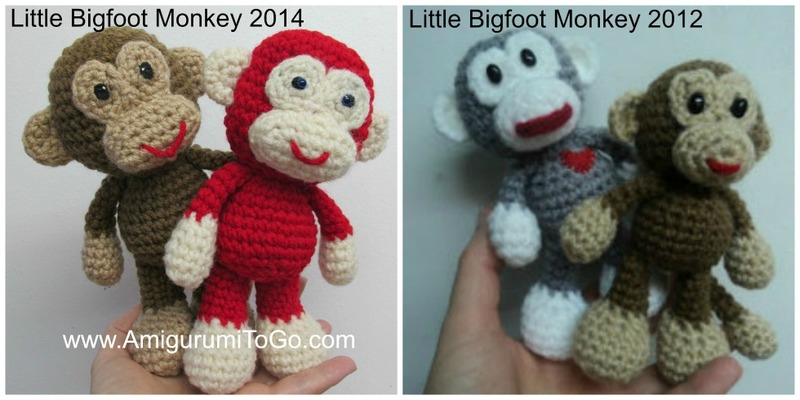 Love the video, only crocheting for a few months now and made the monkey for my grandson. How do I put a pic of it on here? Thank you it was great! I've just finished one! It's so cute!!! Thank you so much. I enjoyed doing it so much that I will make a couple more just for the joy of it. My children and my adult friends love my creations. I've already made the CAL bunny and the teddy bear. Your blog is amazing. Thank you again. I wish I could show you a picture of my latest monkey. It can be seen on my page on Facebook. This one I made into a girl monkey. She's two shade of blue with a bright green dress and bow. So cute. I wouldn't recommend eyes if the ami is going to a baby. I would be afraid to recommend anything and then have something go horribly wrong. Maybe embroider them, that would be the safest. If you look on pinterest there are tutorials for embroidering eyes or even google it, "embroider eyes for doll". Thank you for teaching me how to crochet! Here is a link to my blog where I will put up my work. This little monkey turned out ok, but I'm not all happy with it! Hola gusto en conocerte me gustaria saber que significa 1 0 2mp por favor gracias felicitaciones por sus proyectos son hermosos,gracias por compartir sus conocimientos. Hi. Thank you so much for the free written patterns and your youtube videos, they help me a lot. I am in the process of making the monkey for a birthday present for a one year old for his birthday in March. I will be glad to share a pic when I am finished. Do you have a pattern for dragonflies or dolphins? Thank you in advance. Dear Sharon,Thank you very much for the tutorials and youtube vedios.I finished one with the help of your vedio and it was so cute & I love it so much.. :-) Thank you again & wish u all the very best!!! Thank you so much. I can't wait to try one of these. I'm a beginner with crochet but I think your video will do the trick. Thanks again. soooo happy I found your website and youtube! It doesn't look like you are responding to comments anymore, but I love this pattern and was wondering if you had tips for increasing the size? Would love to have a bigger monkey. Thanks! you count 6 in your row count. You do 4 complete rows. I'm thinking of making a binkey holder for a friend. It looks like this would probably be too large- do you have anything smaller? For some reason, the print friendly version shows the steps correctly but converting it to PDF, the body section is missing steps after 9.
so weird.. I don't know how to fix that, the Print Friendly is a free service we get to place on our blogs but we have nothing to do with how they work. I do have copy and paste enabled on my blog though.. left click and drag over the area you need, once it is highlighted, right click anywhere inside the highlighted area, click copy, then you can paste it into any program you use such as word or notepad etc... Hope that helps! I wasn't sure where to put this since it isn't specific to the monkey but I don't use Facebook so hopefully this is an okay place. My daughter is a huge fan of the Little Big Foot animals and I was wondering if you would mind if I mix and matched parts to increase her collection. Using the elephant trunk, monkey tail, and rabbit ears in the same doll, for example. We love the patterns. Your creativity has brought tons of entertainment to our household and lots of joy to my young daughter. oh absolutely! Mixing them up is a great idea.. feel free to modify any of my patterns, I don't mind at all. Have fun! Thank you for the great pattern!Your instructions are easy to follow! 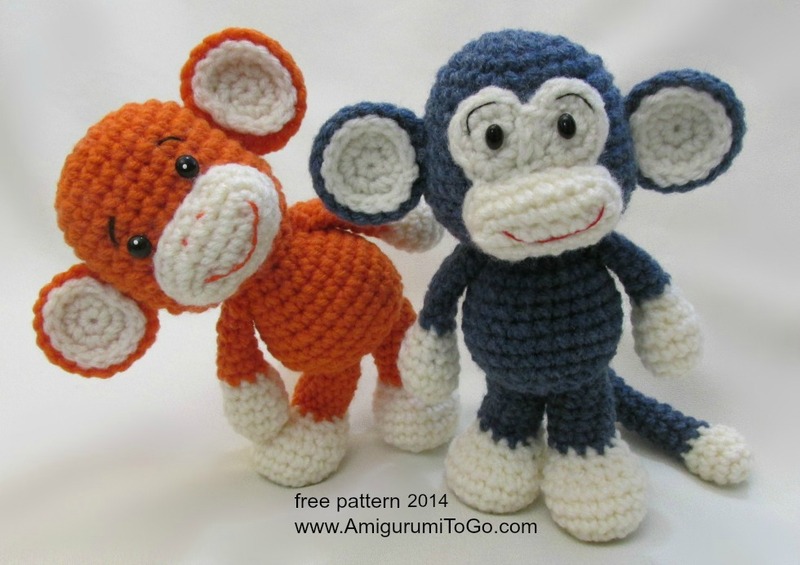 What color yarn did you use for the orange monkey? They are so adorable! I love your patterns so much! Hi. Can you please also add a pattern for a small sweater and cap for him?